UPDATE [2013.05.01]: Simplified steps and updated code and sample. As a dear reader pointed out, the old post wasn't beginner friendly (and yes I confused myself as well). 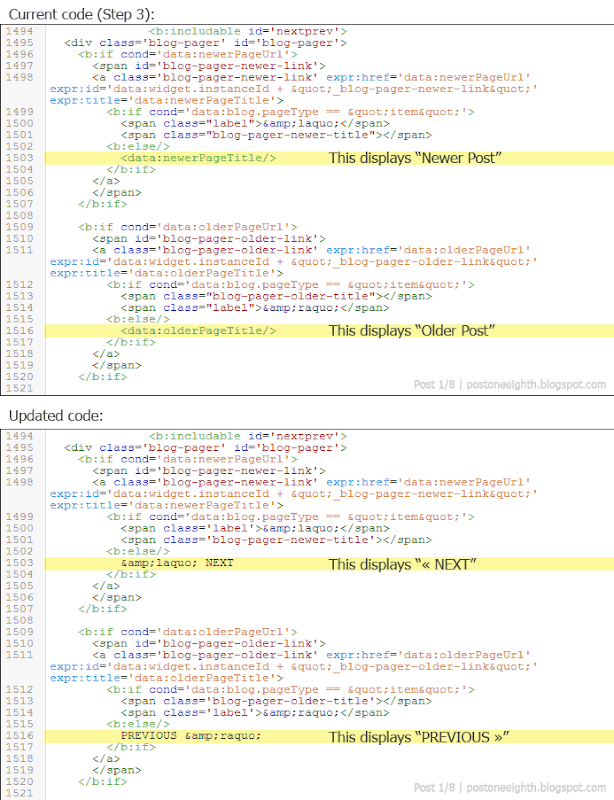 By default, at the end of each Blogger post, we get the "Newer Post" and "Older Post" navigation links. As I have seen in other sites, it looks better if it showed the next and previous post titles instead. So in this tutorial, I will show you how to customize your post navigation links so that it will display the titles of your next and previous posts. Replace "Newer Posts" and "Older Posts" with post titles. Before we begin, backup your template first or maybe use a test blog instead. To backup your template, go to your blog's dashboard then Template » Backup/Restore » Download full template. Step 1. Adding the script. Step 2. Modifying the template. Next is to update the template code. TIP: In Blogger's (new) HTML Editor, you can search for a line of code by clicking anywhere inside the text area. Press Ctrl+F then type in your search word in the search box that appears in the upper right corner. 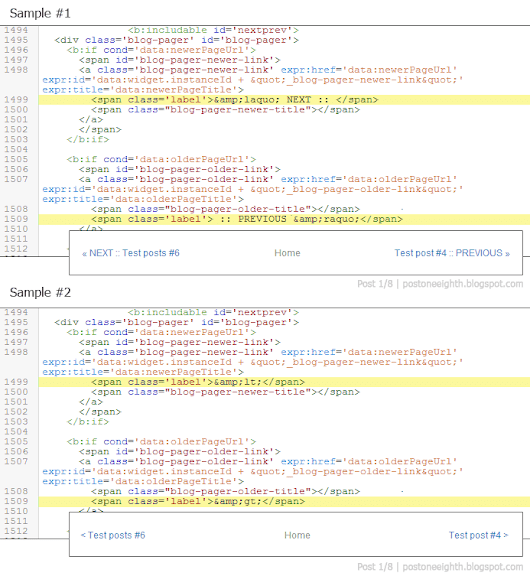 Replace <data:newerPageTitle/> and <data:olderPageTitle/> with the new code. And we're done with the basic setup! 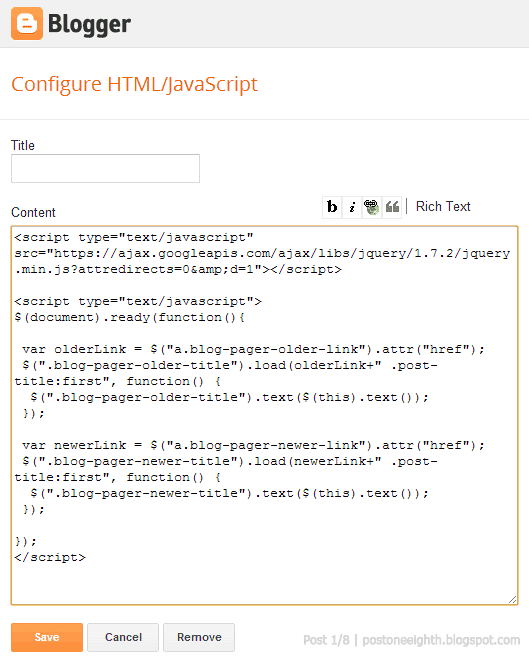 Save your template and check your blog whether all is running ok.
With this basic setup, the post title navigation will work on all pages of your blog -- homepage, search results, archive list... 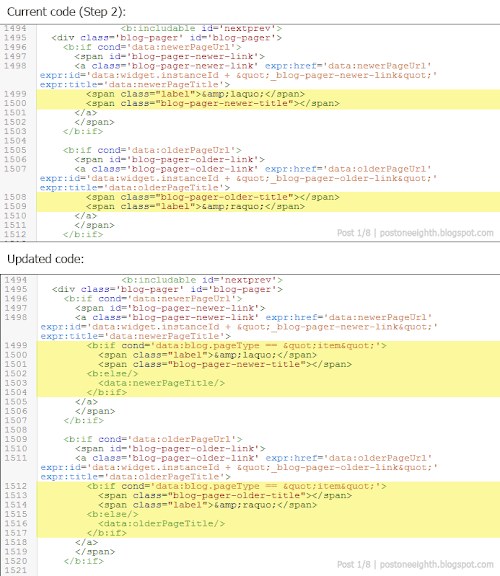 Normally, with these type of pages, your navigation should be "Newer Posts" or "Older Posts". So in the next step, we will setup the post title navigation to work only in Item pages (i.e. the post's page itself). 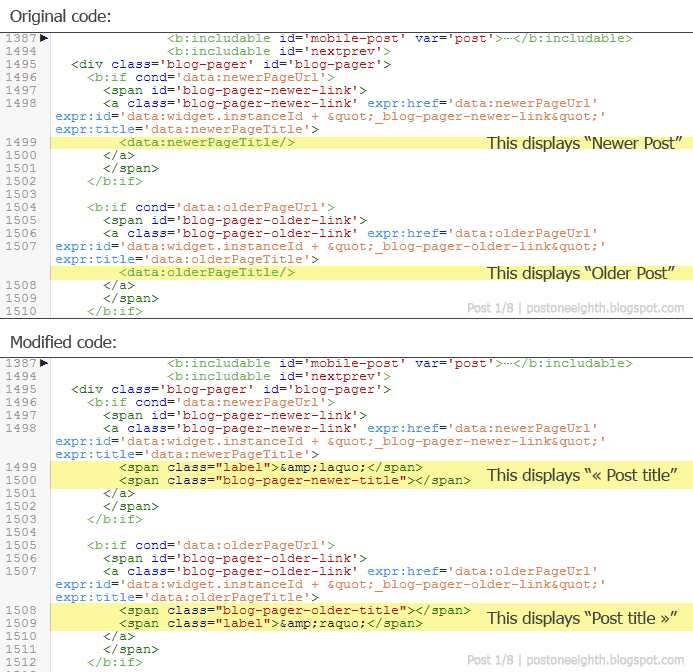 But if you still prefer to leave your post title navigation as is, you can just skip Step 3. Step 3. Using the post title navigation on Item pages only. 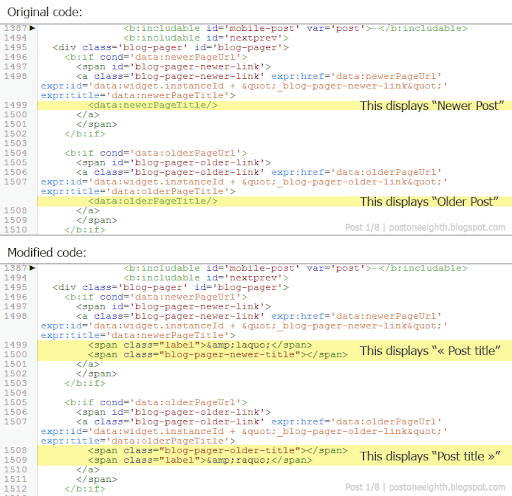 Update the code so that the post title navigation displays in Item pages only. Step 4. Using your own navigation labels. Now if you want to use your own labels instead of the "«" and "»" provided in the code we added earlier, just change the text between the <span class="label"> and </span> tags to whatever you want. IMPORTANT: When putting in your navigation labels, note that there are special characters such as "<",">","&","'" (and others) that will generate an error in your template if you input them as is. As you may have noticed in the code given earlier, a simple "<" should be written as &amp;lt;. Don't worry though if you are not familiar with this. BloggerSentral has this tool to convert the special characters automatically for you but after the conversion, don't forget to replace all & with &amp; (e.g. &lt; should be written as &amp;lt;). Use your own text for the navigation labels. And if you followed Step 3, you might also want to customize the labels on the non-Item pages as well. 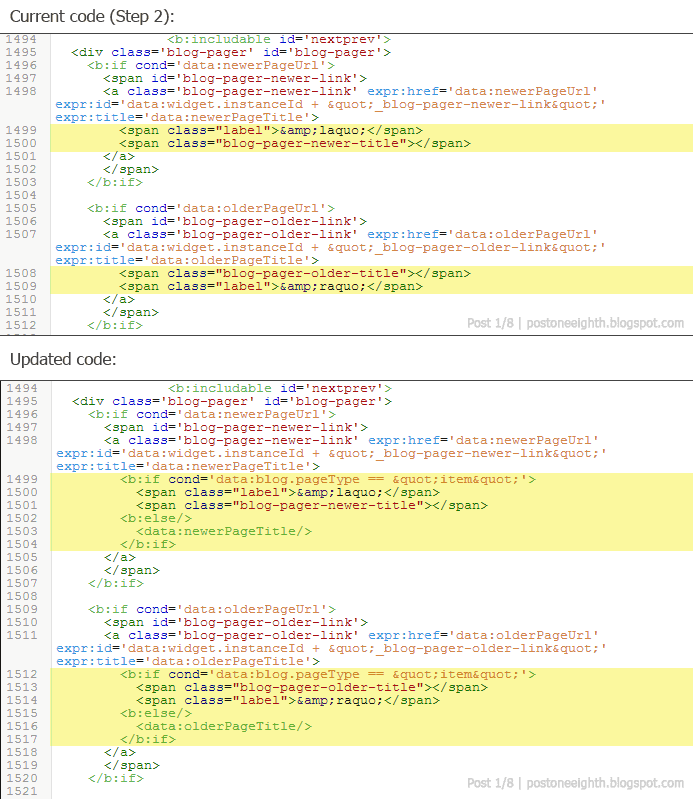 If you prefer not to use the default "Newer posts" label, search for <data:newerPageTitle/> in your template code and replace it with whatever text your want. Do the same for the "Older posts" label. Search for <data:olderPageTitle/> and replace it with your own text. Customize the navigation labels for non-Item pages. This is the label for the post title links (e.g. Next/Previous, Older/Newer Posts, «/»). This serves as a fallback. In case the jQuery script doesn't run, you will still see a "« Next" label rather than just an empty line. Any tag can be used in place of span. Any class name can be used in place of "label". This will contain the post title. 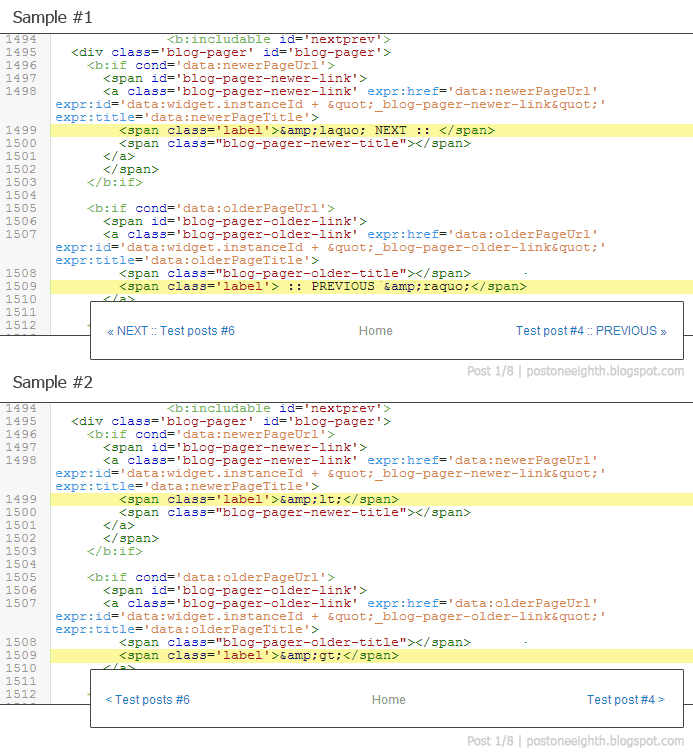 Its class name can't be changed without also changing the jQuery script. Any content placed inside this tag will be replaced with the post title unless the script is modified to append the contents. And that's it. If there's anything I missed or messed up, feel free to let me know in the comments! Hi, this is wonderful, but I think the explainations are a bit long3. Is it possible to simplify the step by step? i'm not very familiar with html nor css, and I read it paragraph by paragraph. Well I think all noobies will do that haha. Is it possible to customise the font of the post titles and put a border around them? Can I do this with a div class? Thanks you very much... Working 100%. You are a great man!!! This scrip - along with the original - keeps returning the older post and newer post, based on the current URL, which sometimes contains a label search. Is there a way to base the URL on the homepage so that it doesn't keep looking for the next post under a label, of which there isn't one. This is what the older posts link returns after one of my other navigation links as been pressed.. The blog isn't active yet. I have tried the step 3 and it works as you suggest. However, the problem is that when the page is a label search, newer and older links give newer and older pages only with that label search and there are no 2 pages that have the same label, so I get nothing. What I need is newer and older posts regardless of the labels search results. The same way it works from the homepage, but as soon as I click one of my custom links, which search for a label, the navigation stops working as it should. There are no older posts with that label, so you get nothing. What I want is to show older posts regardless of the label. I have navigation that takes you to the latest 8 posts by naming them so the labels will need to be unique. Its also the way bloggers own tabs menu works. No the homepage is only 1 post - the very latest one. Each post needs its own page, or rather look like it has its own page, apart from the archive which will just be everything else, each post is 1500 words and includes an image. I know I'm using blogger a little out of it's comfort zone, but it suited a purpose. I'm now wishing I had used something else however, as these little issues take ages to resolve and I'm also having issues when breaking out of the mobile view, back to web view on IOS devices, something that is popular when browsing using an ipad or large screen device. Hmm One issue at once I guess. I can't help thinking this issue should be easy to resolve. The script that generates the link doesn't know what your blog address is, so it must add the link to the end of the current address. So in our example.. So in theory, if I could just change the link to an absolute address (which I specify) or get it to ignore the search label bit, it would work. Thanks I am looking for that. I will do on my blog style.